Generac now offers an extended warranty program for your Generac/Guardian generator. *If your generator is registered and is less than 1 year old from the date of purchase. 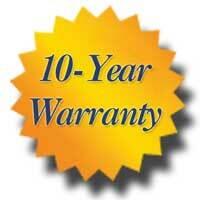 Generac offers 5,7 and 10 year parts and labor warranties for your generator. If for any reason your generator fails to perform as designed. Generac will coordinate the repair or replacement of your Generac air or liquid cooled power plant at no charge. This is the best value you can purchase and guarantees system functionality for the life of this extended warranty agreement. This warranty is only valid for 2014 and newer model generators that are less than 12 months from the date of purchase. This warranty is only valid for Nexus and Evolution model generators that are less than 12 months from the date of purchase. All above payments due at warranty acceptance. Annual maintenance is required to be provided by Home Power Systems, normally $215.00, for a discounted rate of $195.00 for the length of the warranty, or warranty is void. This can be billed yearly. In the event of rotor and / or stator failure or any other catastrophic failure from the 7th year onwards, the customer will receive an exchange credit for $1,700.00, provided they agree to purchase additional ongoing coverage on the newly exchanged equipment which is at-least of equal or higher cost than the original coverage on the generator being replaced. This coverage DOES include transfer switches and all parts / labor that Generac / Briggs & Stratton factory warrantys cover. If generator was installed by others, an installation compliance report must be completed to assure minimum installation standards at no charge. This coverage DOES NOT include the enclosure, batteries and fuses.